Want a truly awesome gaming statue or cosplay suit? Build your own life sized Samus Aran from Metroid with just paper and glue! This DIY papercraft masterpiece let’s crafty Metroid fan’s create their very own Power Suit. The SNES is getting a retro reboot as a mini console! The SNES Classic Edition system has the original look and feel of the 90s home console, only much smaller! Plus, this one comes fully loaded with 21 games! Take control of King Koopa and terrorize your friends with this Bowser hand puppet! Move his mouth with your hand while doing your best Bowser impression… or worst impression. Can’t get thrown by his tail when he’s on your hand! Take that, Mario! Welcome weary traveler, allow me to ease your pain. Rejuvenate your body, mind, and 8-bit soul by transforming your bathroom into a Great Fairy Fountain! Bring the classic game back to life each time you take a shower! Join the Mario Bros and all their friends for a game of Uno like no other! This version includes a special Super Star card that makes your character invincible so you can bounce back those nasty Draw cards back to the player! This crystal Heart Piece replica will certainly create the ideal center piece of any Zelda fan’s collection! This dazzling item comes with it’s own collectors box and looks as though it’s has come straight out of Hyrule. Put the Pokeflute away and take out your Pokedollars! With this Snorlax bean bag chair you’ll be utilizing the tummy of the fattest, most laziest Pokemon in all of Kanto as a snug resting spot. 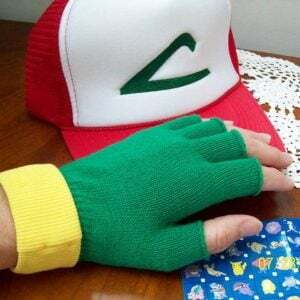 Relax in total comfort as you catch ’em all! What better way is there to express your feelings then with a beautiful bouquet of Pokemon? Each synthetic rose in this bouquet is also accompanied by a Pokemon. A romantic and geeky gesture for the one you love. Show off your love for Mario with a Nintendo 64 made in the likeness of the Italian plumber. This console comes fitted with super bright LED lights that illuminates the inside, while having a coat of glossy paint for the perfect finish. These planters are perfect for Nintendo lovers! 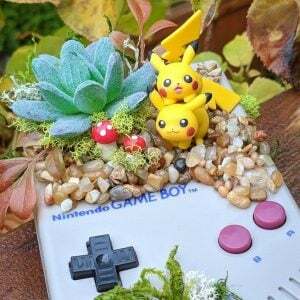 Made with authentic shells, these consoles are made with faux succulents so you never have to worry about watering. Available in either the classic Game Boy or Nintendo DS. This replica of Link’s Hookshot is a beast! Luckily it’s not real otherwise it may very well rip your arm out of its socket. Creates the ultimate piece of Legend of Zelda memorabilia, or the perfect finishing touch to your Link cosplay. Even though the charged-up energy particles in this Mega Buster has gone, Mega Man’s gun can still remain very useful in your hands! This Mega Buster double pint glass operates on both alcoholic and non-alcoholic fuel cells. Accent your Legend of Zelda game shelf with this incredibly detailed Twilight Princess inspired terrarium! This is a one of a kind terrarium is made from Wolf Link and Midna figures, surrounded by craft moss and flowers. Have your next amiibo’s appearance altered to feature a cool new design! Each figure is fully functional, personally hand painted and carefully personalized. You can even request a custom order to have one made just for you.